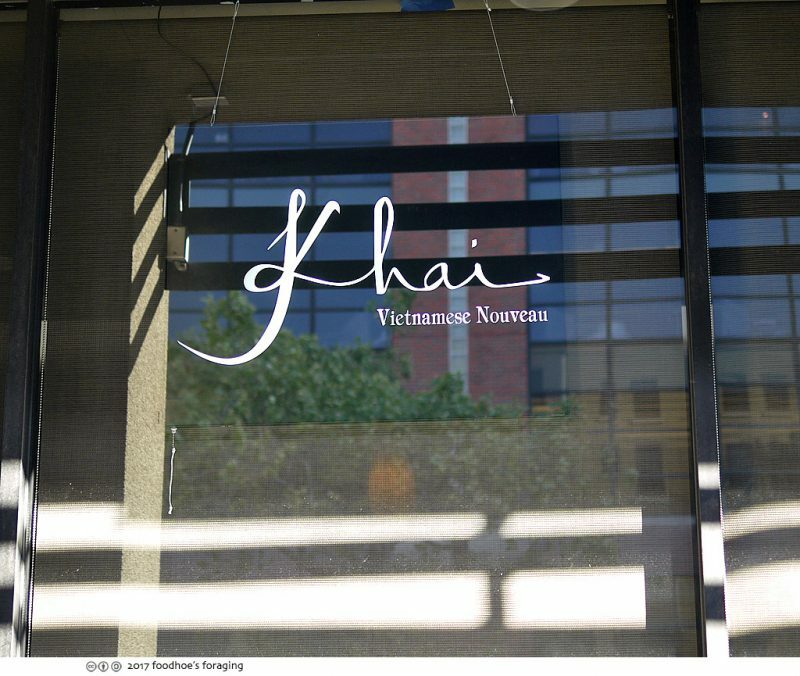 Mr. K and I recently went to visit Chef Dương Khải’s new restaurant which is located in the design district of San Francisco. 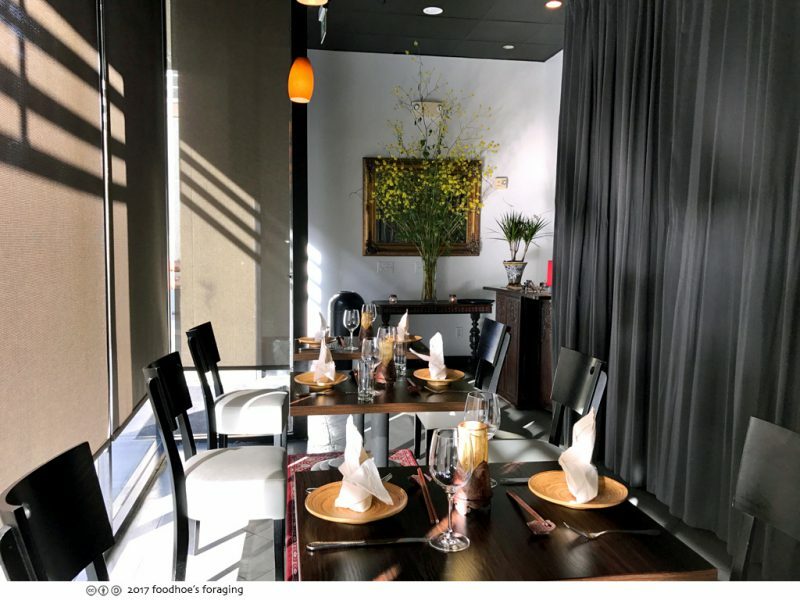 It creates a cozy little restaurant row along with destination restaurants Omakase and Okane tucked in amidst the design showrooms and tech companies. The tiny restaurant has just 20 seats which makes for an intimate setting to enjoy the ten-course tasting menu showcasing Chef Khải’s signature creations based on the simple dishes and flavors found in his homeland which he elevates with impeccable ingredients and prepares with refined and modern techniques. We felt very pampered by our server/host Roberto who poured wine pairings for us from Lincourt Vineyards and tended to our every need. Chef Khải himself served many of the dishes to us while describing his inspirations and interesting facts about the ingredients. 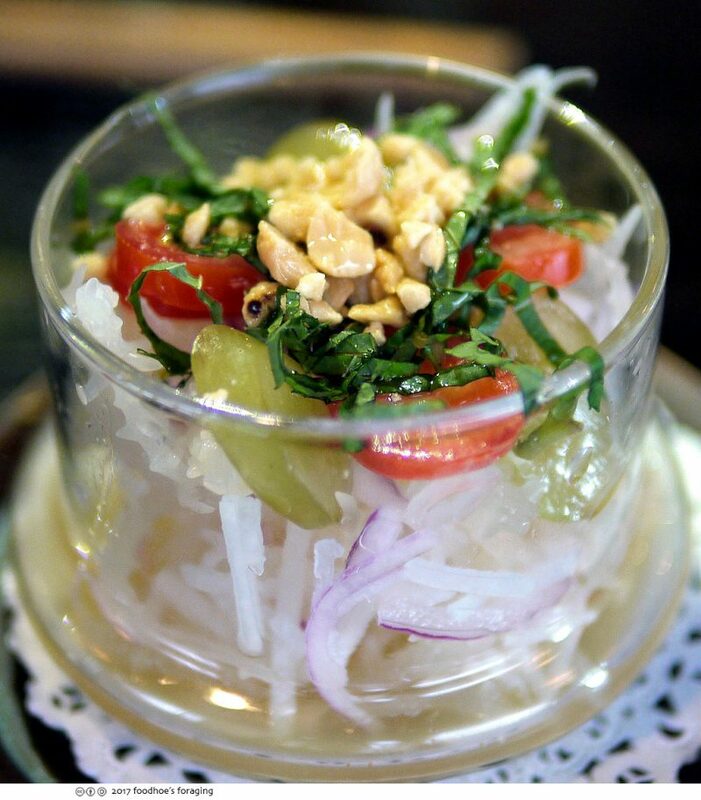 We began with glasses of chardonnay to enjoy with the fresh seaweed salad which was like exploring a jewelry box filled with beautiful slices of onion, juicy grapes, and tomatoes, tossed in a light house dressing then garnished with chopped peanuts and fresh mint. He told us that it reminded him of a dish his mother used to make and that he imports the seaweed from Vietnam which is colorless because it is harvested by hand from deep waters. The dish explodes with salty, sweet, acidic flavors and we loved the variety of textures from all of the vegetables and wonderful snappy crunch from the seaweed, which looked like delicate, edible coral. 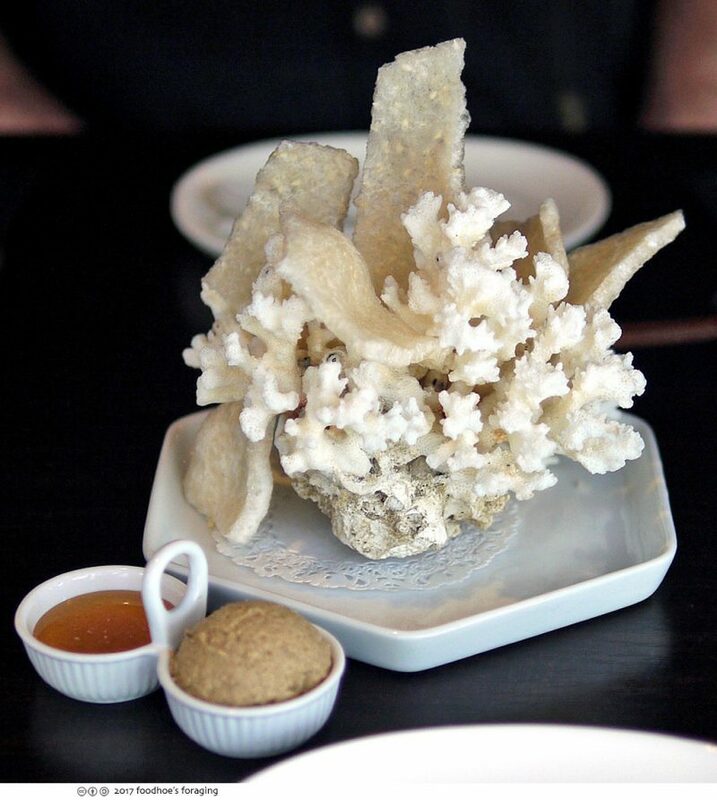 The next course was dramatically presented with thick rice crackers tucked into a dried coral base. It was fun to pull the crackers out to spread with Wild Matsutake Mushroom Pate then drizzle with local honey and Himalayan salt. Chef Khai told us that he foraged for the mushrooms in Oregon and although we were doubtful about pouring honey on mushroom pate, it was one of those times where the sum is greater than the parts, the pairing of sweet and savory flavors on the delectably crunchy crackers really sparkled on my tastebuds, and I just can’t resist the crunchy texture of those shrimp chips. 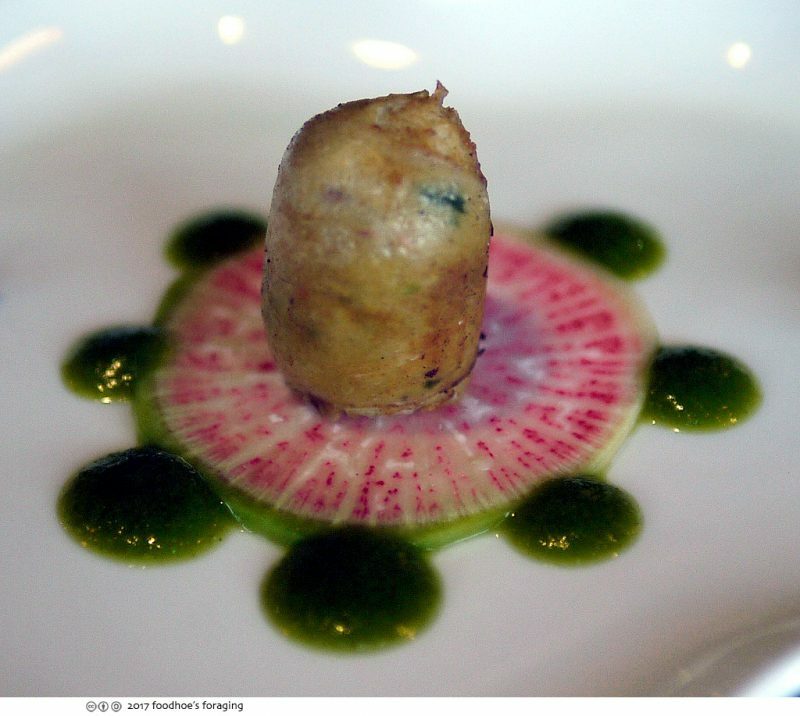 Next was one of Chef Khai’s signature dishes, local dungeness crab sausage with matsutake mushroom, served on a thin slice of pickled watermelon radish ringed with dots of a spicy kafir lime and jalapeño sauce. The colorful presentation was fun to eat and delicious. 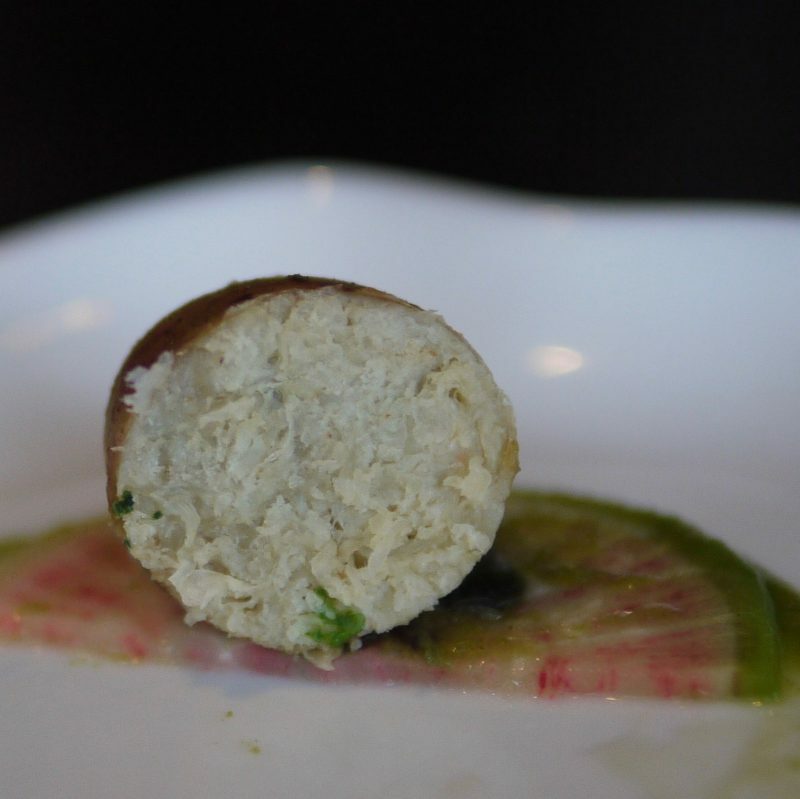 The interior of the sausage is finely ground, dense and meaty with a squishy texture like a fish cake which soaked up the aromatic kaffir lime and jalapeño sauce. One of our favorite dishes was made from wild salmon ceviche with thin slivers of pork belly, rice noodle, egg, green apple, shiso and peanuts. 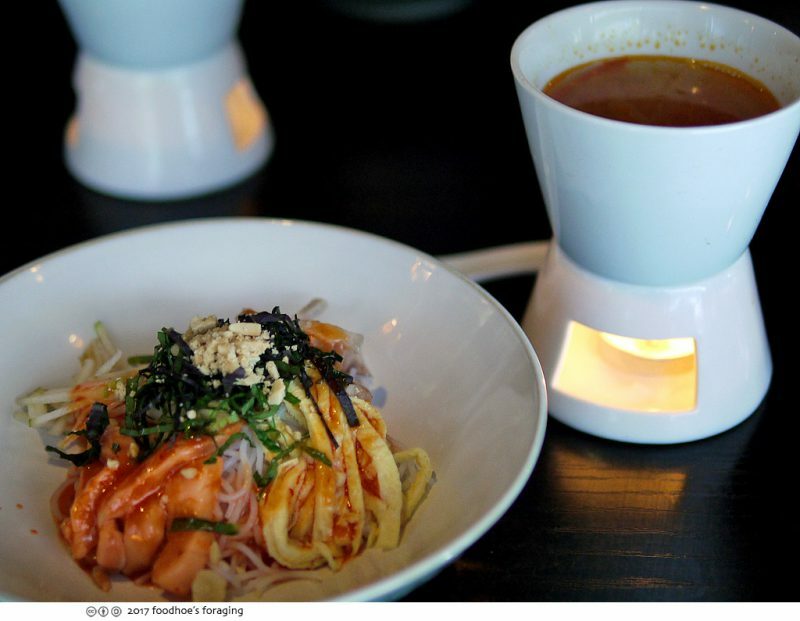 It was a beautiful vermicelli bowl drizzled with a delicious spicy banana sauce and served with a tart brothy soup of minced shrimp, tomatoes, onion and saffron. We switched to a spicy Pinot Noir to go with the next courses. 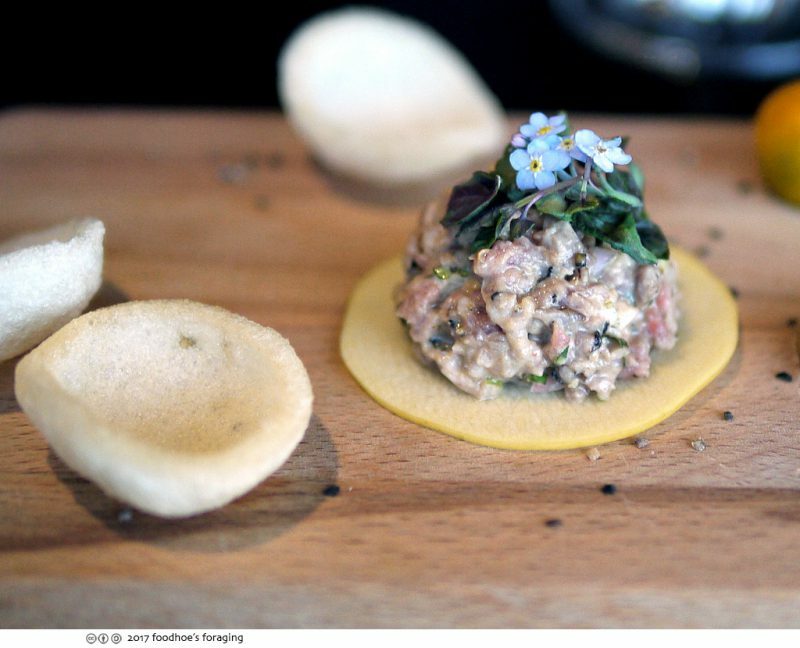 The beef tartare had a rich smoky flavor and was served medium rare, chopped and mixed with onion, coriander, tamarind. It was lovely on the shrimp chips and a squeeze of calamansi added bright acidity to each bite. 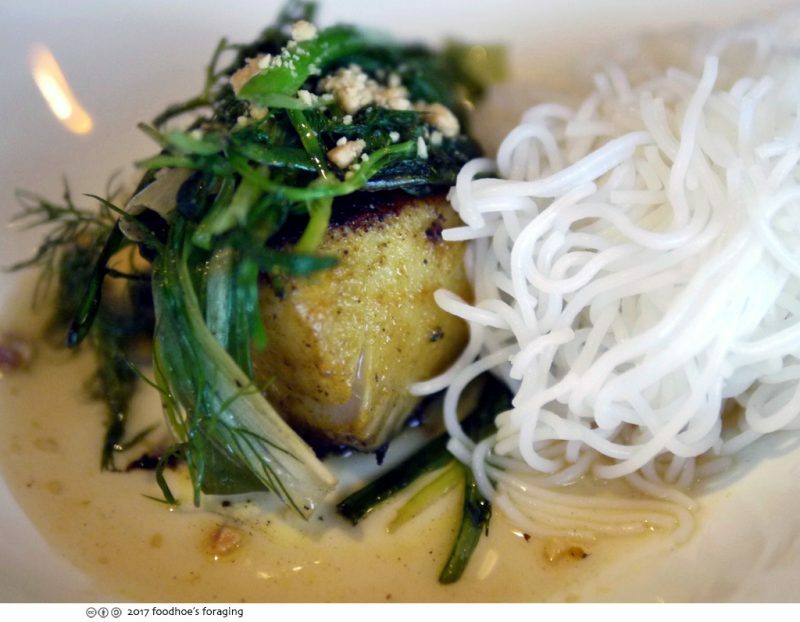 His version of Hanoi’s iconic dish chả cá was a tender and juicy filet of roasted butterfish (black cod) marinated in turmeric and galangal for 24 hours, then cooked with fresh dill, garlic, spring onions and served with the ubiquitous rice noodles and scattered with chopped peanuts. 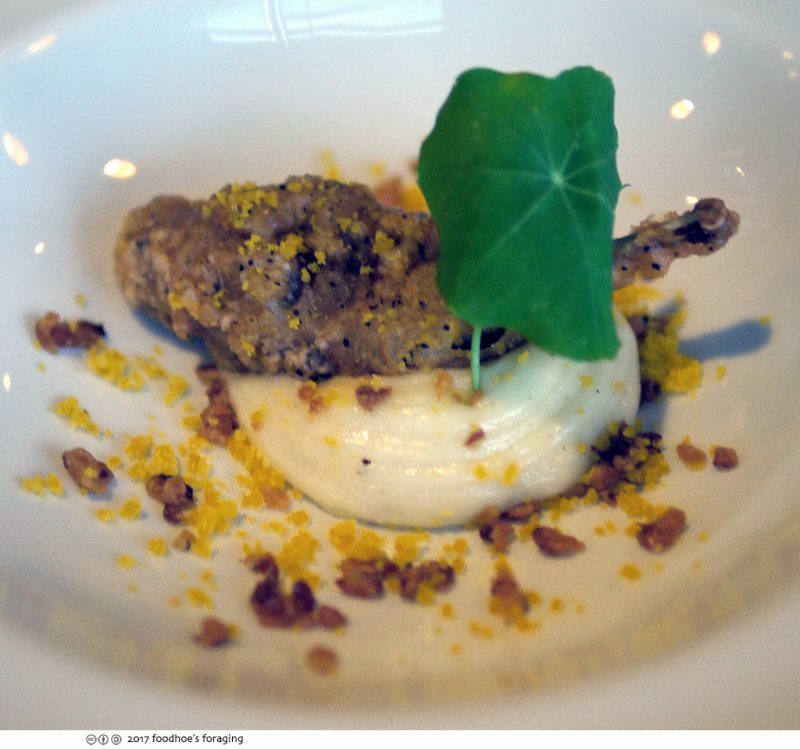 The panfried quail, was served fresh from the fryer and garnished with an edible nasturtium leaf. At first I tried to tackle this with a knife and fork, but ended up picking up the tiny fried chicken leg and eating with my hands. I felt like Tom Hanks in the movie Big eating baby corn… I loved the crisp chewy crust and the entire dish was sprinkled with roasted garlic, sieved salted egg, and served over a delicious mound of mashed cassava and potato drizzled with truffle oil. 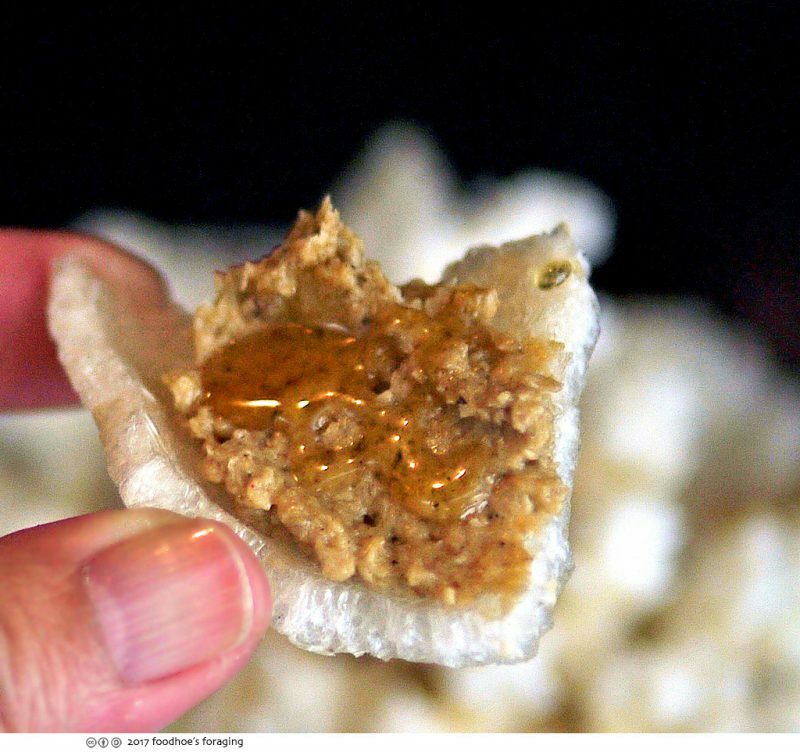 The starchy cassava added a delightful sticky texture that was so very moreish. The Pan Seared Rack of Lamb with lemon grass was tender and juicy with a deliciously charred crust. It was a perfectly petit portion served over egg plant, drizzled with scallion oil and impaled with a sprig of fragrant rosemary. Chef Khai signed the menu for me and said he would be tweaking it to incorporate seasonal ingredients. There was never a dull moment in the meal, each dish was vibrant and flavorful, with liberal uses of aromatic and fresh herbs. We dined as guests of the house, and felt so welcome as if we were at his house, thank you Chef Thai and crew for a delicious and memorable feast. 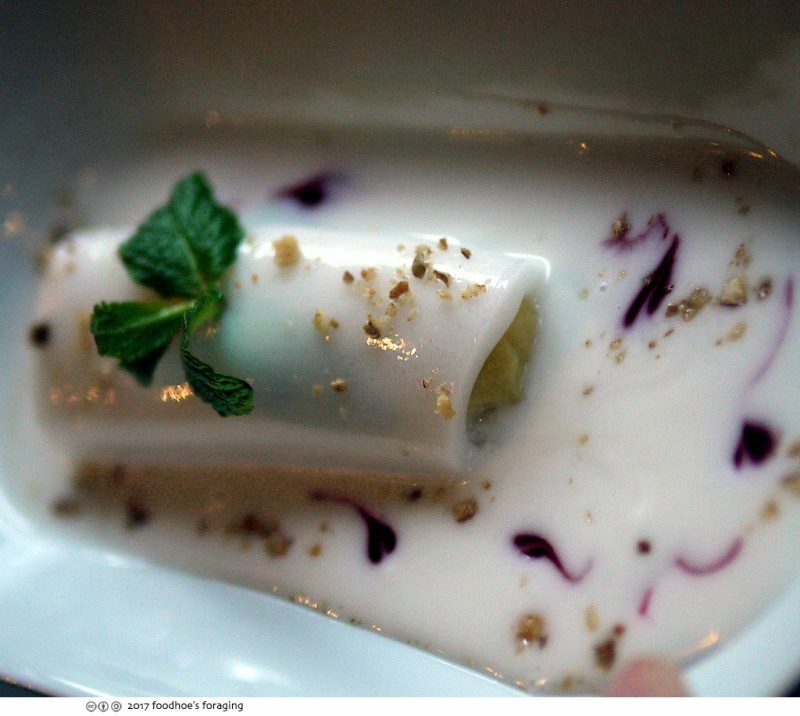 I highly recommend a visit to experience the sparkling flavors of Chef Khai’s tasting menu for a special night out. It’s a party at Chef Khai’s! Chef Khải graduated from Le Cordon Bleu Academie Culinaire de Paris, and over his 30-year career he’s worked at a number of acclaimed restaurants, including Le Bernardin in New York City and Le Notre Patisserie in Paris. 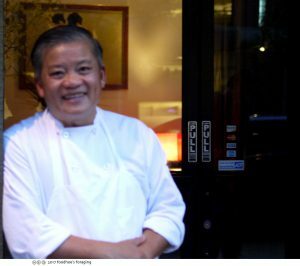 In 2000, he opened Ana Mandara in San Francisco where he became known as one of the pioneers of modern Vietnamese cuisine and when it closed in 2012, he traveled to Asia and won gold in the International Beijing Culinary Competition and then spent some time serving as principal judge on the Vietnamese Iron Chef cooking show where he picked up some inspiration in the kitchen. He was so gracious and very photogenic too. Open Tuesday – Sunday with two seatings: 5:30 pm and 8:30 pm (20 seats). 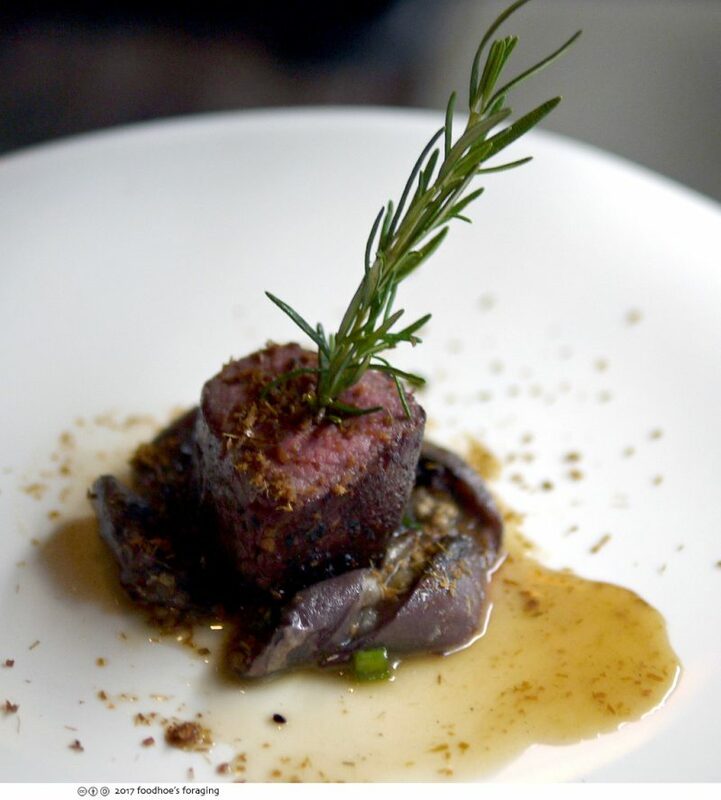 A 24 hour cancellation is required for reservations otherwise, you will be charged 50% of the tasting menu per a person. After reading this, I don’t think I’ll want to visit a Vietnamese restaurant while we’re in Provence next month. Anything I find there won’t come close to this!